Fits Mikuni RS Flatslide Smoothbores, 34mm, 36mm, 38mm, 40mm. Also fits a variety of stock carburetors. Fits any carburetor with a 55mm intake bell. To see if APE Super Pro air filters fit your stock carburetor, click on your make below. APE SUPER PRO AIR FILTERS - Fits Mikuni RS Flatslide Smoothbores 29mm. Also fits a variety of stock carburetors. 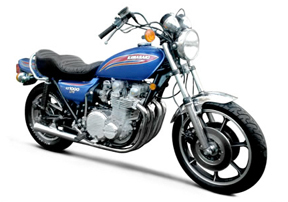 Clutch Pushrod - Kawasaki Z1 (1973 - 1975), KZ900 (1976 - 1977), KZ1000 (1977 - 1980). Direct OEM replacement. Valve Keepers - Kawasaki KZ/GPZ 650 thru 1100 2 valve. Stainless Steel Valve - Kawasaki 1000J, GPZ1100 - 33mm ex. Stainless Steel Valve - Kawasaki 1000J, GPZ1100 - 38.6mm in. Stainless Steel Valve - Kawasaki 1000J, GPZ1100 - 40mm in. Stainless Steel Valve - Kawasaki 1000J, GPZ1100 - 32mm ex. Stainless Steel Valve - Kawasaki 900 / 1000 thru 1980, 7mm stem (radius groove) - 31mm ex. Stainless Steel Valve - Kawasaki 900 / 1000 thru 1980, 7mm stem (radius groove) - 37.5mm in. Stainless Steel Valve - Kawasaki 1000J, GPZ1100, 900/1000 thru 1980 - 38.5mm ex. Stainless Steel Valve - Kawasaki 900 / 1000 thru 1980, 7mm stem (radius groove) - 33mm ex. Stainless Steel Valve - Kawasaki 900 / 1000 thru 1980, 7mm stem (radius groove) - 36mm in. Stainless Steel Valve - Kawasaki 900 / 1000 thru 1980, 7mm stem (radius groove) - 30mm ex. Valve Stem Seals - Kawasaki 650 thru 1100 2 valve, Suzuki GS1000 2 valve. Cam Cover Plugs - Kawasaki KZ, Z1 and 1000 (except J model). Black. Cam Cover Plugs - Kawasaki KZ, Z1 and 1000 (except J model). Silver. Adjustable Cam Sprockets (one pair) - Kawasaki KZ900 / with 32 tooth sprocket for Mark 2 crank. Adjustable Cam Sprockets (one pair) - Kawasaki 1000J / GPZ1100 adapter sprockets. Adjustable Cam Sprockets (one pair) - Kawasaki 32 tooth roller type sprocket. Adjustable Cam Sprockets (one pair) - Kawasaki KZ900 / 1000 through 1980 with 30-tooth sprocket. Set of 12 - Head Nuts - Kawasaki 650 thru 1100 2 valve fours, Suzuki GSXR 750 / 1100 oil cooled models, GS1100/1150. Heavy Duty Clutch Kit - Kawasaki 1000J, GPZ1100. Heavy Duty Clutch Kit - Kawasaki KZ650 Air Cooled. Heavy Duty Clutch Kit - Kawasaki Z1, KZ1000 (thru 1980). Cylinder Studs - Kawasaki 650/750 2-Valve Fours. Cylinder Studs - Kawasaki 900/1000/1100 2 Valve Fours. Kawasaki KZ Low Profile Breather Cover - With Tapped Hole. Heavy Duty Clutch Springs - Kawasaki Z1900, KZ1000 (chain drive). Heavy Duty Clutch Springs - Kawasaki KZ1000 shaft, KZ/GPZ1100. Low Profile Oil Filter Cover for Kawasaki Z1900 and KZ1000 thru 1980. STARTER NUT - KZ/GPZ SMALL TAPER CRANKS, 22MM SEAL DIAMETER. BILLET STARTER PLATE - KAWASAKI, 22MM SEAL DIAMETER. Trac King High performance clutch pack - Z1900, KZ1000 '76-'81. Titanium Valve Spring Retainers - Suzuki GS1000 2 Valve (Using APE VS750S Valve Springs and #21-604 Keepers), Kawasaki KZ650, KZ/GPZ750 Fours, Z1, KZ900, KZ1000, KZ/GPZ1100, and KZ/GPZ using APE VSP500 Valve Springs. Titanium Valve Spring Retainers - For APE, Manley two-valve pro mod springs. Bronze Valve Guides - Suzuki GS1000 2 valve, Kawasaki 650 thru 1100 2 valve. Heavy Duty Valve Springs - Kawasaki KZ650, KZ/GPZ750 fours, Z1, KZ900, KZ1000, KZ/GPZ1100. Heavy Duty Valve Springs - Kawasaki KZ/GPZ Heavy-duty racing springs, up to .500 lift. Heavy Duty Valve Springs - Kawasaki KZ/GPZ Racing spring up to .520 lift. SHIM UNDER TAPPETS - KZ/GPZ 550 THRU 1100 - STANDARD OD.